The Pier & Times Square 950 Estero Blvd. 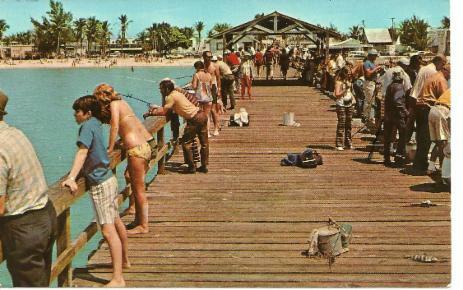 This beach public fishing pier was built in 1946, after replacing the Winkler Beach Hotel pier which was destroyed in the 1944 hurricane. It has also been the focus of beach activity as anglers seldom leave without a string of fish, while others simply enjoy the stroll to watch or later take in a sunset and the evasive "green flash". 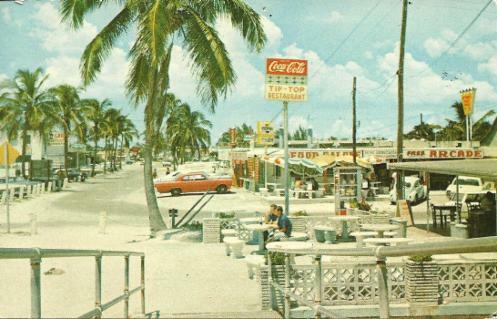 Pictured above, beachgoers could park at the foot of the pier or picnic at the beachside tables, then extend the day and grab a hot dog, pizza, or ice cream at the "Breezy Freeze", or the "Tip Top", which specialized in cooking the catch of the day. The popular business district at the corner of Estero Blvd. and today's old San Carlos Blvd. had ample parking at the "Shrimp Box" takeout service, as seen below. Today this is Times Square. 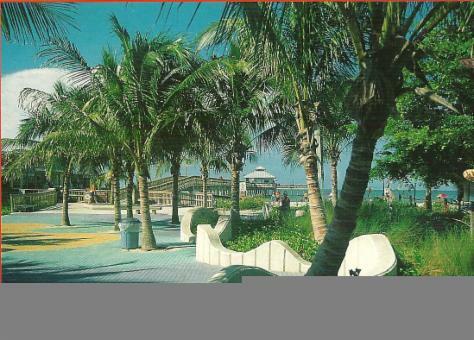 By 1950, the county park to the north of the pier was purchased with more parking, and a children's playground was added in what is today Lynn Hall Park, with facilities and shelter. 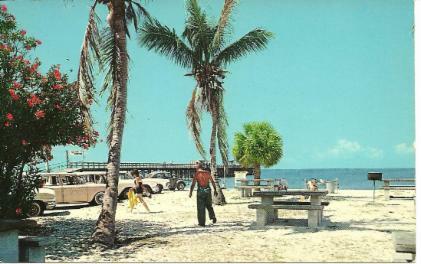 The pier was condemned and closed to the public in 1975 until it was replaced as a prestressed concrete structure. The ramp entrance, souvenir bait house, and the "T" extension at the end, with benches and shade roof, were eventually replaced with the longlasting recycled "new wood". Meanwhile today's "Times Square" was born when the previous "drive through" at the business district roadway at the foot of the bridge was closed and resurfaced. A vibrant pedestrian plaza in the late 1980's with restaurants and additional shops experienced new life when store fronts opened up with additional dog friendly umbrella seating. The walking district attracted street performers with a new energized focus on outdoor living. In addition, the old San Carlos streetscaping picked up the beat to the hub of beach life at this popular pier and Times Square setting.